Have you ever sat at your desk or in front of the television when excessive hunger pangs struck? What if the hunger pains come shortly after eating a large meal—how on earth could you possibly be hungry, right? It just doesn’t make sense. Excessive hunger can be a pretty touchy topic. If you’re constantly hungry or never feel full—even after consuming a whole meal—it can lead to confusion, guilt, and even considerable weight gain. But if you’re always hungry, it might not have anything to do with hunger itself. Your hormones play a major role in how you feel, and your state of mind can easily trick you into feeling hungry, regardless of how recently you ate. Women tend to have rampant appetites throughout pregnancy and during their menstrual cycles—and it all has to do with hormones. A woman who is nine months pregnant actually doesn’t have to consume that many additional calories per day to feed her baby, and much of the cravings have to do with hormonal changes. Keep in mind that constant hunger, and the hormones associated with it, has nothing to do with gender—it is rather common amongst men, too. For example, I can remember a great number of times where I spent the day hungry—and it had nothing to do with being underfed. It primarily had to do with hormonal conditions that tricked me into thinking I was hungry. Even mild dehydration can make you feel hungry. When you’re thirsty, the hypothalamus in your brain is activated; however, it is the same part of the brain that’s activated by hunger. The lack of water, therefore, can make you feel like you had a lack of food. So if you recently ate, then it could be a case of confusion—your brain thinks you’re hungry, but you really need water. If you find yourself feeling hungry after or between meals, it’s likely that you just need to top up on your fluids. Drink a glass of water, and if you’re still hungry after 20 minutes or so, then eat, but chances are you won’t be hungry anymore. It’s important to note that dehydration kicks in before you feel thirsty—so even if you’re not thirsty, you still might not have enough fluid. The best way to avoid dehydration is to sip water throughout the day. You can also monitor the color of your urine to make sure you’re adequately hydrated. If it’s clear or slightly yellow, you’re well-hydrated. The yellower and darker it gets, the less hydrated you are. Not getting enough sleep plays a major role in excessive hunger throughout the day. When you have a poor night’s sleep—or successive nights of bad sleep—it changes your body in a couple of ways. First off, ghrelin, a hormone that stimulates appetite, increases when you don’t get enough sleep. This leaves you hungry throughout the day and can often lead to more intense hunger as the day goes on. Lack of sleep also impacts a hormone called leptin. Leptin is the hormone that counteracts ghrelin—it provides the feeling of fullness. Leptin levels decrease when you don’t have enough sleep. In addition to hormonal changes caused by a lack of sleep, a night of poor sleep will also leave you low on energy. So how do you get more energy? More calories. 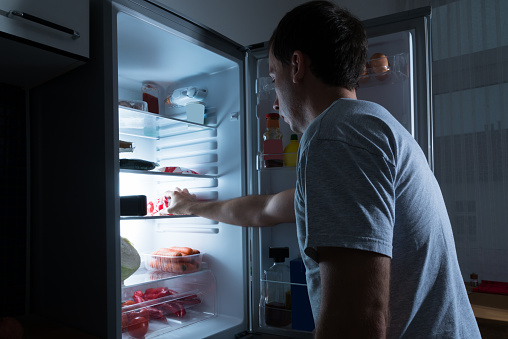 Your body will instinctively crave food when you’re low on energy. To combat these changes, try to get more sleep. If you do have a poor night’s sleep, be sure to eat a high-protein breakfast the next morning and stay away from snacking on sugary foods throughout the day. Constant hunger can also stem from the fact that you’re simply not eating enough every day. If you’re adequately hydrated and eating regular meals, but still hungry, then perhaps you have a caloric deficit. This is quite common in people who are dieting, but not exactly sure how to diet properly. Furthermore, if you’ve recently adopted a more active lifestyle you need to increase food intake to provide the extra energy you need. To get an accurate idea of how many calories you need per day, click here. All calories are not created equal, so the bulk of what you’re eating should be made up of nutritious options like vegetables, healthy fats, lean protein, fruit, and whole grains. Much like being short on sleep, stress can alter your hormones. Cortisol levels rise when you’re under stress, and it makes you feel under attack—otherwise known as fight or flight. To fight back, however, you need energy. Your body believes it needs to eat to get this energy, resulting in hunger. In addition to rising cortisol levels, stress also lowers serotonin. This creates hunger, and in particular, cravings for sugary carbs. The best thing to do is find ways to lower stress in your life. Exercise, yoga, prayer, and meditation are all good recommendations. When you’re in the heat of the moment, however, remember that you’re not actually hungry and it’s the stress playing tricks on you. Grab a bottle of water and leave the situation for a moment so you can calm down and regain composure. Skipping meals is a surefire way to maintain constant hunger, and this is extremely true when you don’t eat breakfast. Eating breakfast within an hour of waking is good to aim for, but within 30 minutes is even better. Breakfast can set the tone for hunger throughout the day, and eating soon after waking up can improve satiety (fullness) and reduce hunger and cravings, while still keeping you energized. Elect for high-protein options like eggs or egg whites, whey protein, Greek yogurt, or a kefir smoothie, as opposed to a bagel, Danish, breakfast cereal, or muffin. In addition to eating breakfast, make sure you schedule a mid-morning snack, lunch, mid-afternoon snack, and dinner, too. By providing yourself quality nutrition all day, you’ll rarely experience intense hunger or cravings. When your automatic response to feeling hungry is to grab something quick and easy—a candy bar, pastry, muffin, chips, French fries, granola bar, etc.—you’re going to stay hungry. These high-sugar snack foods will do little to fill you up. The energy you get is absorbed almost instantly, resulting in a quick “pick-me-up” and subsequent crash, only to leave you hungry again shortly after. Opt for more nutritious and filling options for your meals and at snack times. Nuts, whole grains, and lean proteins will do the trick. Eating whole grains and fruits that are high in fiber also help with satiety. Fiber keeps you feeling fuller, longer, in addition to providing a number of other health benefits. Protein is one of the best options when it comes to staying full. Research shows that eating a high protein diet keeps people full and has hormonal impacts that silence hunger. Try to spread your protein intake throughout the day—get about one gram or so per pound of bodyweight. Some good options are eggs, egg whites, whey protein, chicken breasts, Greek yogurt, turkey breasts, salmon, tuna, beans, and other meats and legumes. Fat also has high-satiety properties, and it’s needed to hold onto certain vitamins. I’ve often found having a tablespoon of peanut butter is a great way to tame hunger and create a long-lasting feeling of fullness. Fats typically take a little longer to absorb, which creates the feeling of fullness. Just be careful about how much you eat, because the calories really add up fast. You can take advantage of fat’s satiety by snacking on almonds or savoring a tablespoon of natural peanut butter when hunger hits! Not all foods are created equal, and certain foods are better at filling you up than others. As discussed, high-sugar, refined carbs are empty calories that do little to fill you. Instead, select options that are high in protein, complex carbohydrates (“brown” carbs and whole grains), and healthy fats to keep you fuller for longer. Alcohol plays a big role in your appetite. Research indicates that alcohol can make you hungrier and crave calorie-rich foods. That’s probably why beer and chicken wings go so well together! In addition, alcohol is a depressant, thus creating hormonal changes that can result in cravings. Alcohol can also spike hunger by dehydrating you, so be sure to mix in plenty of water while you’re drinking alcohol—and keep alcohol consumption at a minimum. Leidy, H., et al., “Beneficial effects of a higher-protein breakfast on the appetitive, hormonal, and neural signs controlling energy intake regulation in overweight/obese, ‘breakfast-skipping,’ late adolescent girls,” The American Journal of Clinical Nutrition 2013; doi: 10.3945/ajcn.112.053116. Fallaize, R., et al., “Variation in the effects of three different breakfast meals on subjective satiety and subsequent satiety and subsequent intake of energy at lunch and evening meal,” European Journal of Nutrition 2013; 52(4):1353-1359. Spiegel, K., “Brief communication: Sleep curtailment in healthy young men is associated with decreased leptin levels, elevated ghrelin levels, and increased hunger and appetite,” Annals of Internal Medicine 2004; 141(11): 846-851. “Why Stress Causes People to Overeat,” Harvard Health Publications web site, February 1, 2012; http://www.health.harvard.edu/newsletter_article/why-stress-causes-people-to-overeat. Hetherington, M., et al., “Stimulation of hunger by alcohol,” Physiology & Behavior 2001; 74(3): 283-289.